As you may recall, I spent quite a lot of time last year working behind the scenes on the Great British Sewing Bee, first for the third series, then for the Children in Need specials, and finally, for the book which accompanies the series. 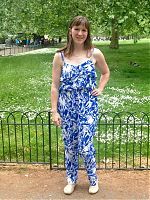 I personally worked on about 60% of the patterns in the Great British Sewing Bee: Fashion with Fabric book, either by sewing up early samples, measuring yardages or trims, or assisting the illustrators with the construction. 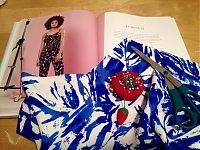 So it’s probably quite funny that the first pattern I make from the finished book (not counting the green pencil skirt, which I made from the book before release!) 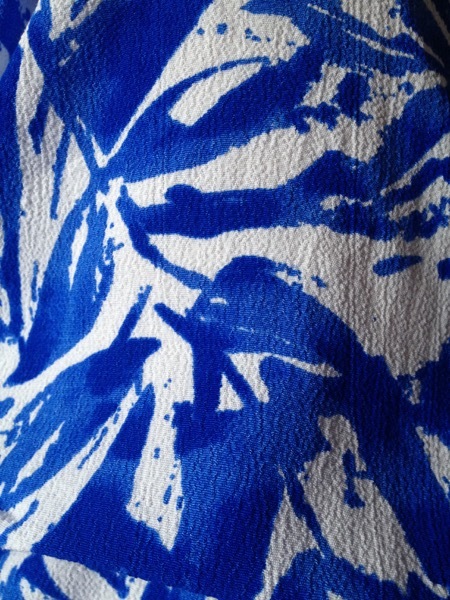 isn’t one I really worked on at all – just one I admired across the studio while others made adjustments. 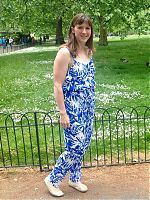 It’s a pattern for a jumpsuit with an elasticated waist and spaghetti straps with a flounced neckline edge. 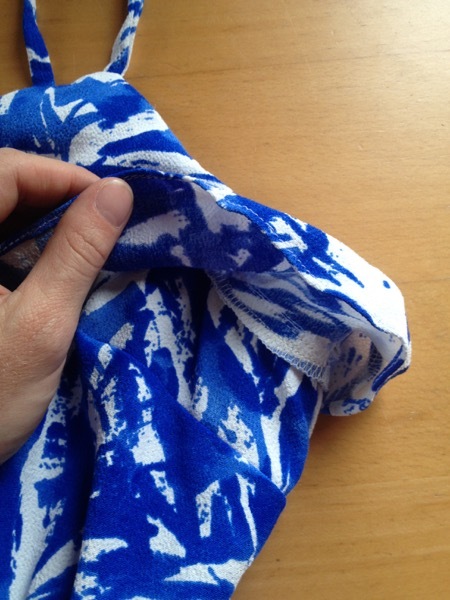 There’s no fussy closures – you just pull it on and off by stepping into it, and I’d definitely say it’s beginner-friendly, especially since the instructions are fully illustrated. The bonus is that you can also make a pair of casual trousers or a camisole top using the same base jumpsuit pattern (also explained in the book). 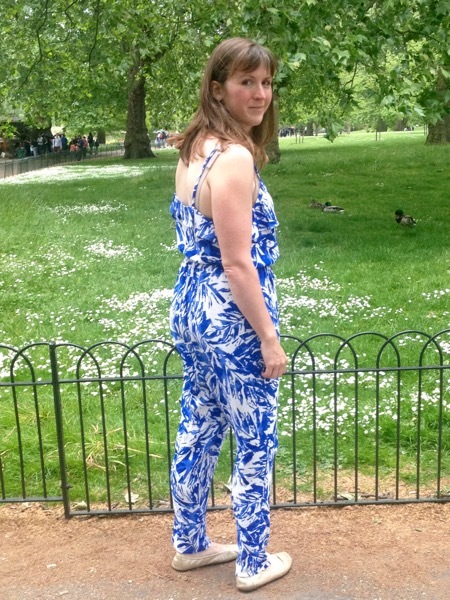 In my experience, the trickiest part of this entire jumpsuit was finding the right fabric! It needed to be something hefty enough for the trousers, but also lightweight enough to drape nicely at the neckline frill, and I eventually found this blue & white crepey viscose from Ditto Fabrics that’s the perfect weight and resists wrinkling so it should be perfect for travelling. It did fray like crazy though, so I constructed this mostly on the overlocker (serger). Doesn’t this just scream summer?? 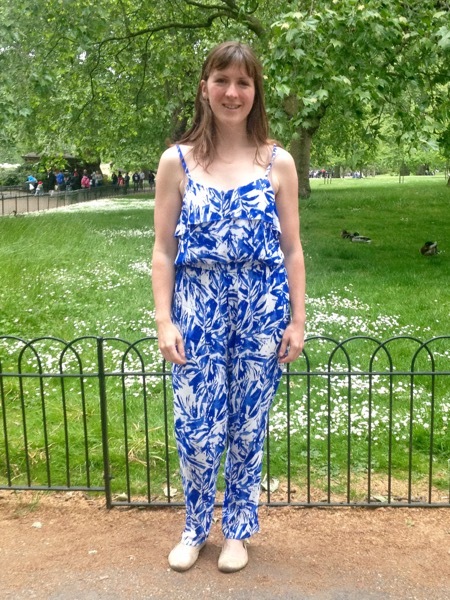 In terms of size, I made Size 14 according to my measurements, and it fits really well – no alterations needed (I should point out that the top/camisole has bust darts so should be easy to do an FBA if you need one). 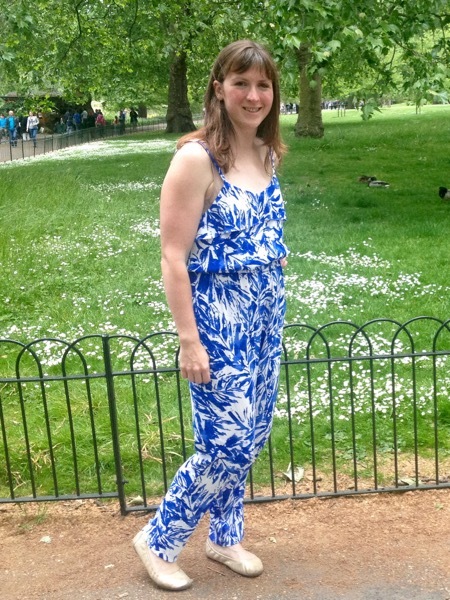 I wore this out to a pub lunch with friends on Sunday, followed by a little walk in St James’s Park (where these photos were taken) and then more pubbing! It was a little chilly, so I layered a grey cropped jacket over top. 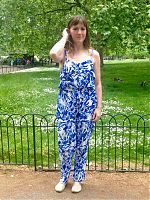 The jumpsuit overall has a casual fit, which is perfect for warmer weather – the legs are nice and loose but with a tapered hem (I find that wide legged trousers make me look incredibly short so I avoid them! ), and the camisole has a nice amount of ease, too – not too close but not too billowy, either. 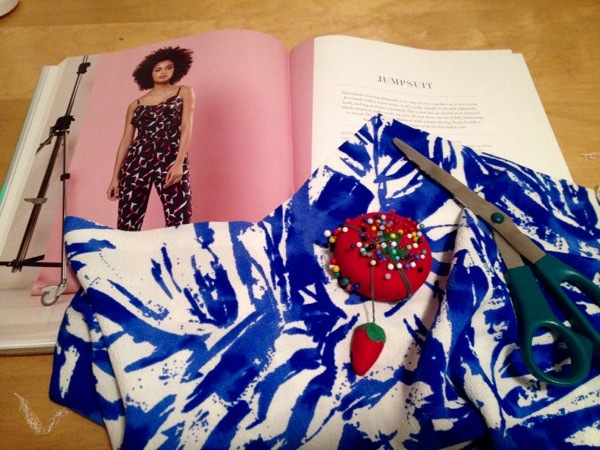 While the included instructions are just fine, I personally made a few changes to the neckline construction, most notably to omit the facings altogether. 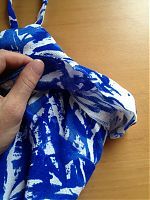 I instead attached the right side of the frill to the wrong side of the body along the neckline edge, then understitched the body to the seam allowance to prevent it rolling outward and showing. 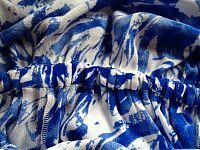 The seam allowances were now hidden underneath the frill, where they’re unlikely to be seen barring a large gust of wind. Oh, and I also stabilised the body’s neckline edge with vilene fusible bias tape before I started since I didn’t have the interfaced facings to stabilise the neckline edge. I didn’t have any white bias tape for the elasticated waist channel inside (and any other colour would’ve shown through), so instead I cut a cross-grain piece of self fabric using the casual trouser “hack” pattern’s waistband (not used for the jumpsuit) as a guide – folded in half along the marked fold line, and this is almost exactly the length and width you need for the elastic channelling (fold back the seam allowances on the short ends at the centre back so you can still get the elastic in). It makes for a super clean finish inside! 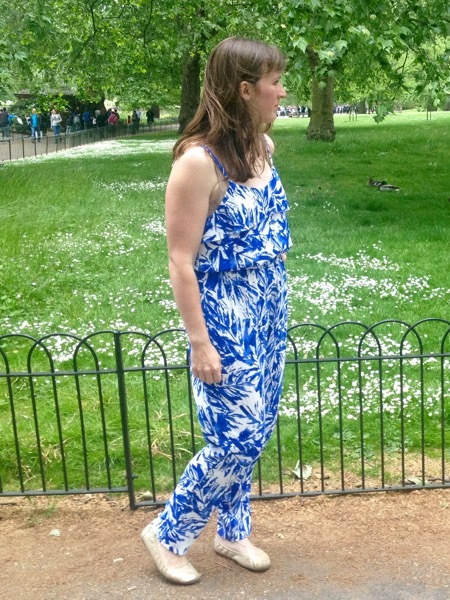 The biggest pitfall with jumpsuits in general is not having enough length, especially in the crotch rise so everything pulls when you sit down or move – this thankfully doesn’t do that, but I think the added rise means the crotch ends up a little on the lower side. 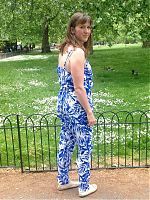 It definitely feels a little low while I wear it (the tops of my thighs rubbed a bit), but otherwise there’s plenty of length everywhere, and the fit is in keeping with a casual trouser. 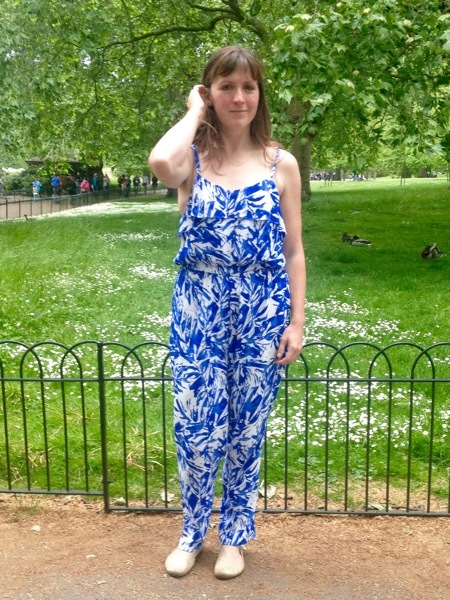 In fact, it’s an extremely comfortable garment, but I’m not quite sure I feel “me” in it yet, as it’s a total style departure for me, both in terms of the print and the jumpsuit itself. 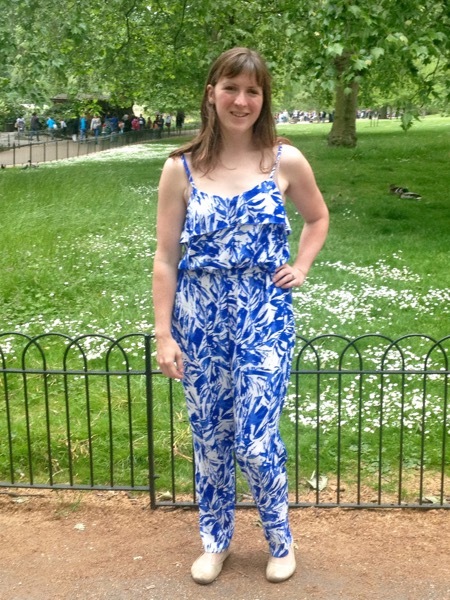 In other words, I’m on Team Jumpsuit, but I’m not sure if Team Jumpsuit is right for me? What do you think? 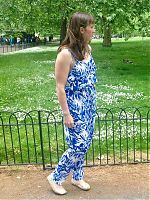 If you’re in the UK, I also noticed that this pattern is the free covermount pattern this month in Simply Sewing magazine, so if you don’t already own the GBSB: Fashion In Fabric book, you’ve got another option for getting this pattern. 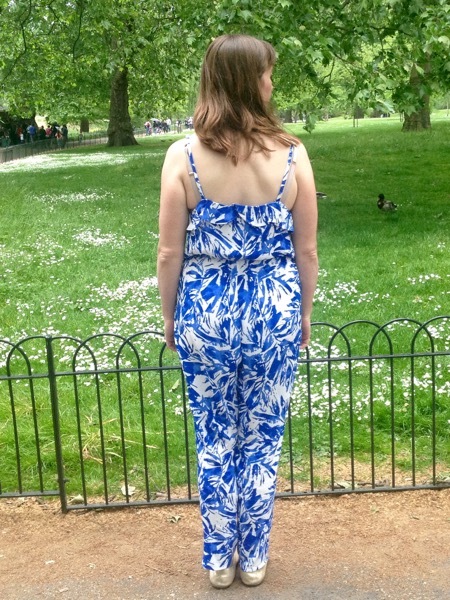 Separator image Posted in Gallery and tagged with book, gbsb, jumpsuit.